In 1991, two water enthusiasts started EZ Dock after finding that traditional dock options just couldn’t meet their needs. Our EZ Dock founders researched dock manufacturers around the world and couldn’t find one that was truly designed for longtime use and for maximizing time on the water. Our founders discovered that wooden systems had to be dismantled and set up every season. They also had to be painted and repaired as they peeled and rotted. This not only meant more time spent on the dock — and less time in the water — but it raised environmental concerns as well since that stripped off paint often ends up in the water. The breaking point came when we invested in some of what were then considered the top-of-the-line dock floats for sale, only to see them disintegrate after the first storm. Since storms are a fact of life especially on the water, we knew our docks had to be able to weather them. Our founders’ goal was simple: to develop practical, attractive, eco-friendly dock systems designed for people who actually use the water. No more one-size-fits all solutions. No more splinters, burned feet or worries about disintegrating docks. No more investments washed away with each storm. The resulting product and collaboration has thrilled industrial, commercial, government and residential customers since 1991. We have developed versatile and customizable solutions for all our clients, so you can create a multiple-boat marina or a simple floating dock. We offer products for wetlands, as well as for kayakers, PWC owners and many more applications. All our products are eco-friendly and made to last. In fact, our docks have weathered multiple tropical storms, and the government calls on us when they need docks and floating platforms for emergency relief. We are proud of the products that we build, and the fact that we offer an unbeatable value when it comes to this type of longer term investment. 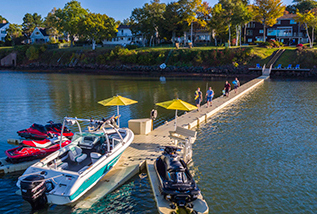 Today, we are the industry leader in floating modular docks, offering a wide selection of dock systems, boat and PWC lifts, and accessories. Combining strength and stability with light weight and low maintenance, our patented designs have applications in both the commercial marine and residential markets. EZ Dock is a part of PlayPower, Inc., the world’s largest recreational manufacturer, which gives us the resources to employ the best people and keep research, development and innovation at the forefront of what we do.